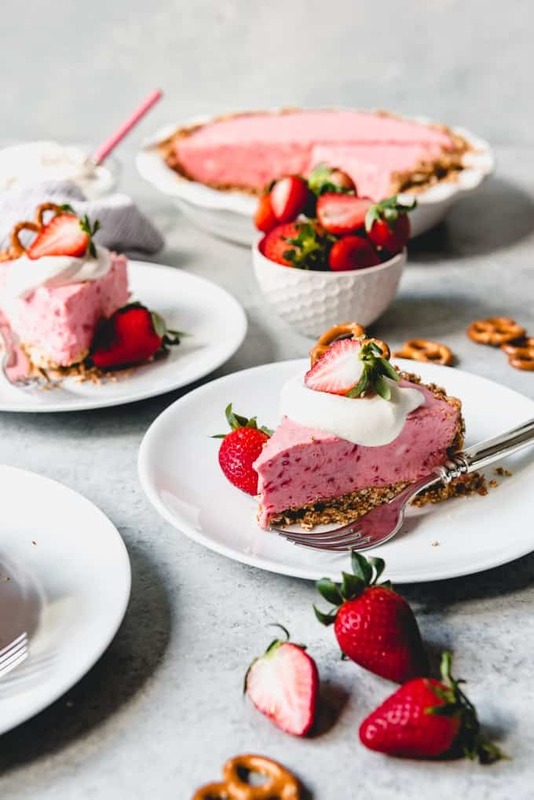 You will want to make this crowd-pleasing Strawberry Pretzel Icebox Pie all Spring and Summer long! 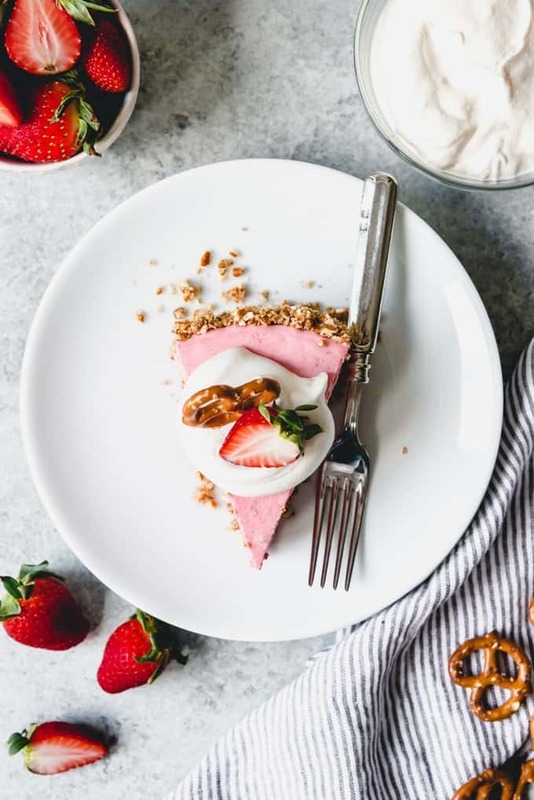 It’s a delicious frozen dessert made with a strawberry cream cheese filling inside a salty-sweet pretzel crust. 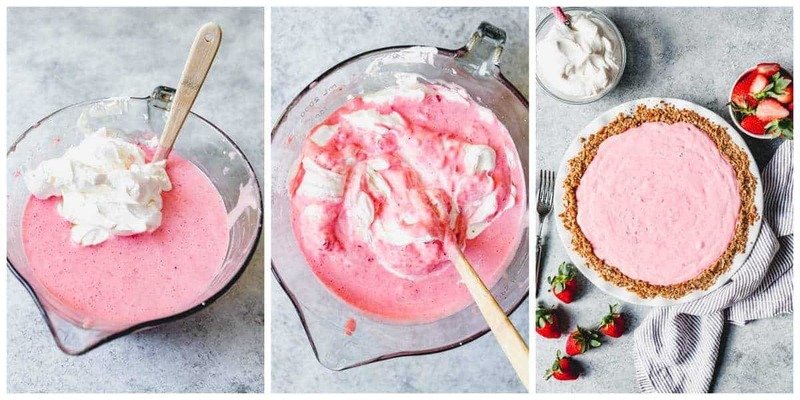 Then the fluffy pink pie is topped with clouds of freshly whipped cream for a simple but tasty dessert that is perfect for Valentine’s Day, Easter, Mother’s Day or basically any time the weather gets warm! 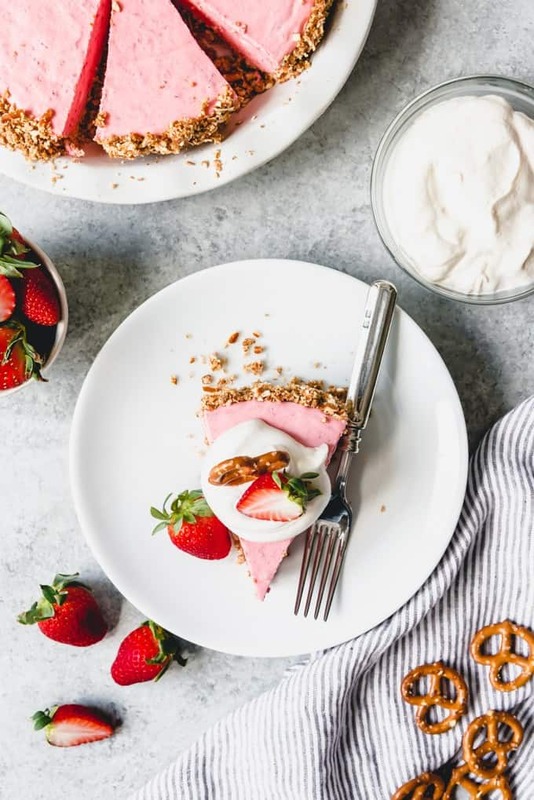 Strawberry desserts are always a hit around our house. 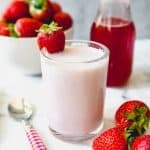 Sometimes we keep it super simple and just have sliced strawberries sprinkled with a little sugar and drizzled with a tablespoon or two of heavy cream. Other times it’s strawberry shortcake or fresh strawberry pie. 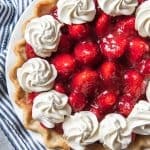 But I wanted to share an almost no-bake icebox strawberry pie variation today that is another one of my favorite strawberry dessert recipes. 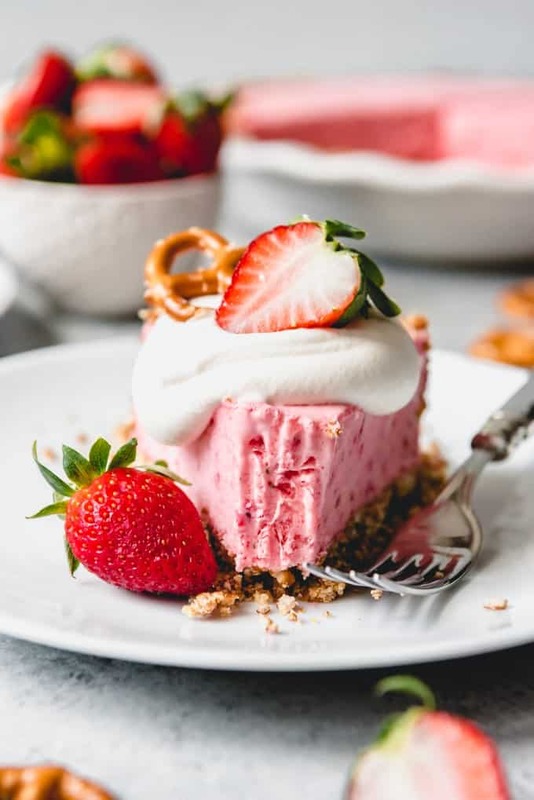 I grew up with a variation of this strawberry pretzel icebox pie that we always called “Frozen Strawberry Yummy”. 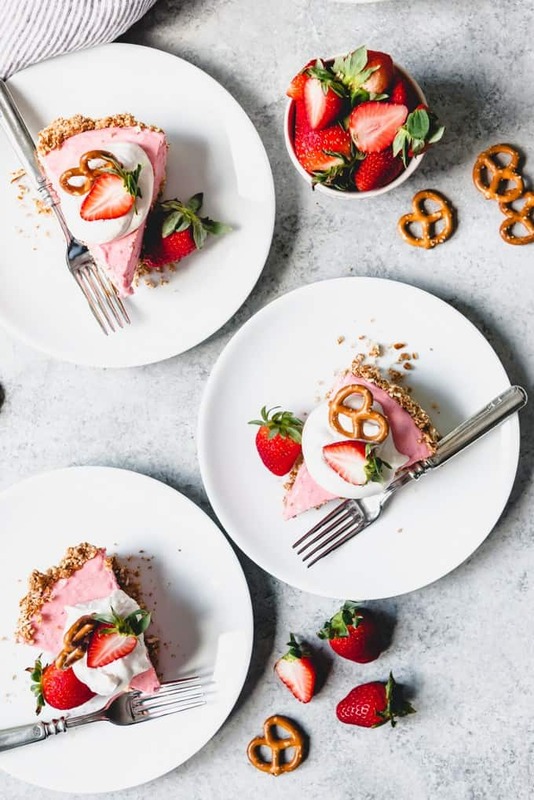 The concept basically involves a unique, salty-sweet crust with a light, creamy, frozen strawberry filling made with pureed strawberries. 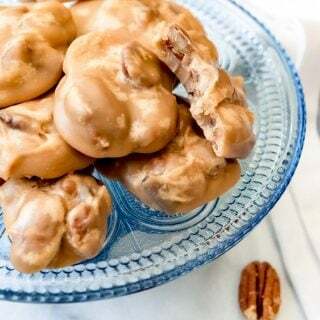 It’s an old-fashioned recipe that reminds me of hot summers at my grandparent’s house where they didn’t have air conditioning and we were always ready for a cool treat that we often ate on the back steps in the evenings since it was still just too hot in the house. 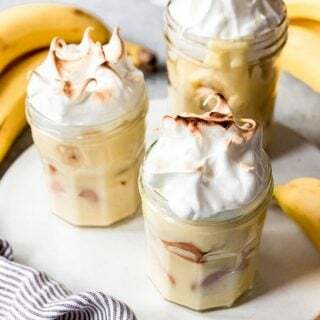 An icebox pie is a dessert that originated in the South and was named for the insulated cooling units that were the precursors to modern refrigerators. These were known as iceboxes and big blocks of ice would be placed inside to keep things cold and fresh. 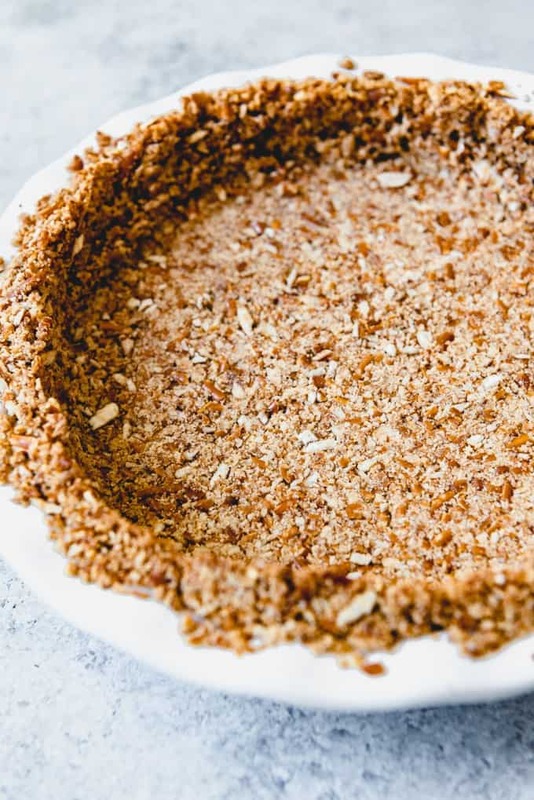 An icebox pie requires little to no baking and sets up in the freezer, making it the perfect cool treat for warmer weather days. 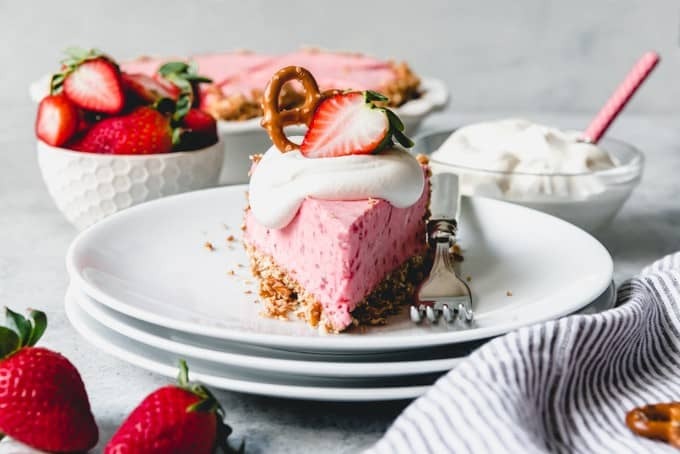 This particular strawberry icebox pie has a pretzel crust that gets baked for just a few minutes to help give it some structure. 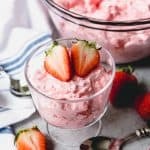 But otherwise the filling, which is made with pureed fresh strawberries, whipped cream, sweetened condensed milk, cream cheese, and strawberry gelatin, sets up in the freezer. 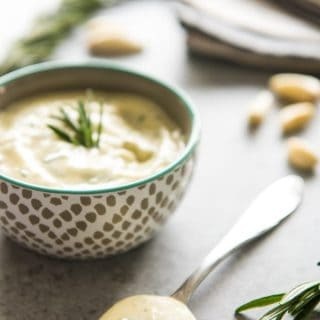 The texture is really unique and can’t be compared to ice cream or sherbet. It has a very fruity, light, richness to it that is a wonderful contrast to the buttery, salty, sweet pretzel crust. Speaking of that pretzel crust, it comes together in a snap. You want finely crushed pretzels for this crust. 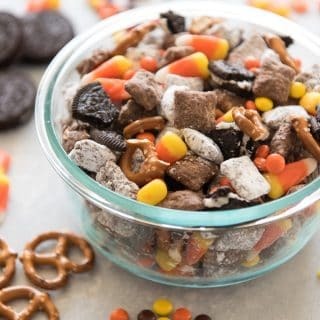 The crushed pretzels get mixed with a little brown sugar and butter and that’s all there is to it! 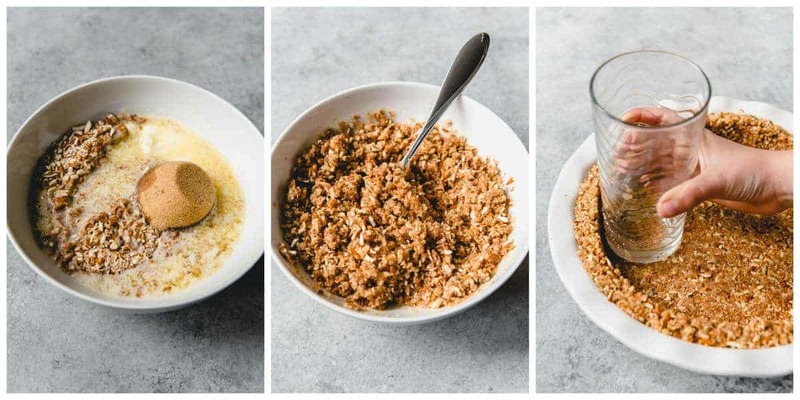 Press the crust into a 9-inch pie plate using the bottom of a glass or measuring cup the same way you would with a graham cracker crust. Then it bakes for just 10 minutes until it’s set. Spoon the filling into the cooled crust. Then pop the pie into the freezer and let it completely freeze for at least 8 hours until it’s firm. 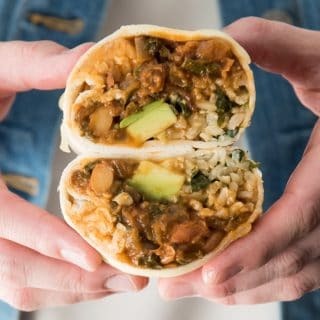 You will want to pull the pie out about 15 minutes before serving it so that it has a chance to thaw just a bit. 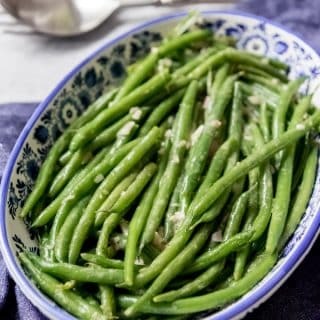 Not only will it make the pie easier to slice and remove from the pan, but the flavor is actually even better when it has softened ever so slightly. I find that if I pull the pie out, then make the whipped cream and gather plates and utensils, the pie is usually pretty much ready to go. 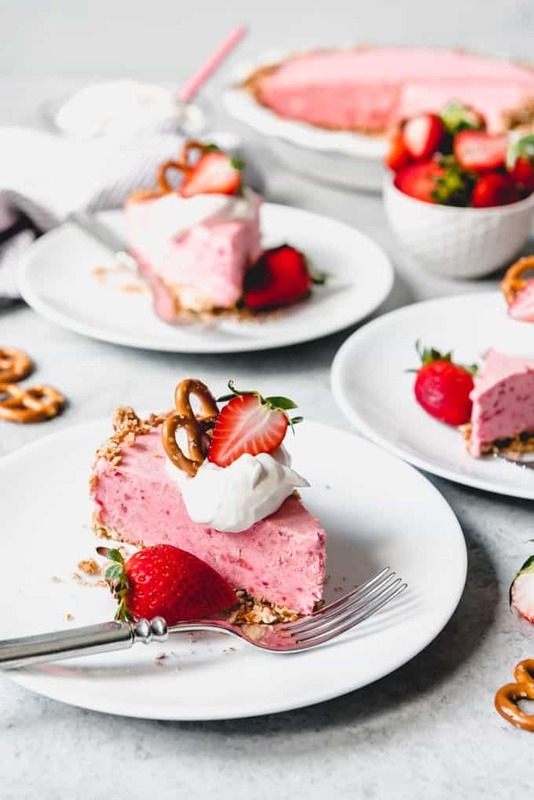 You could spread or pipe the sweetened whipped cream onto the pie, but I like to do dollops and decorate each slice with half a strawberry and a whole pretzel, just for presentation. 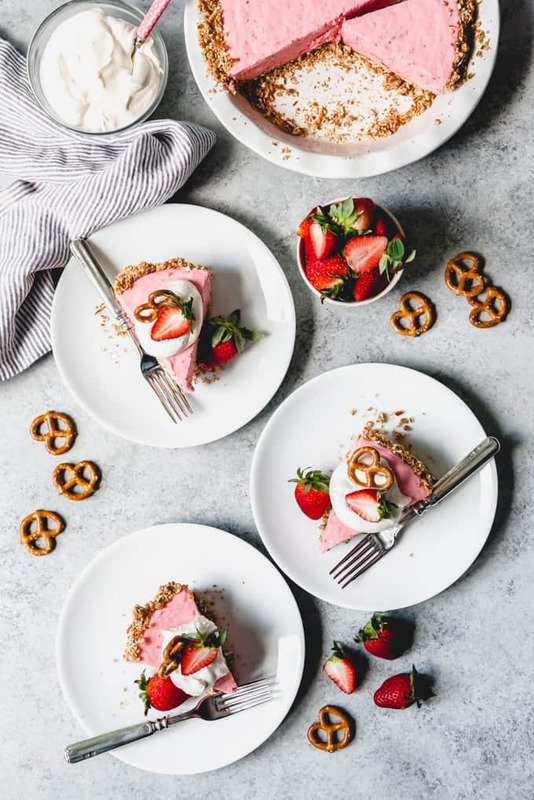 I made this strawberry pretzel icebox pie recipe for my partner, Imperial Sugar. 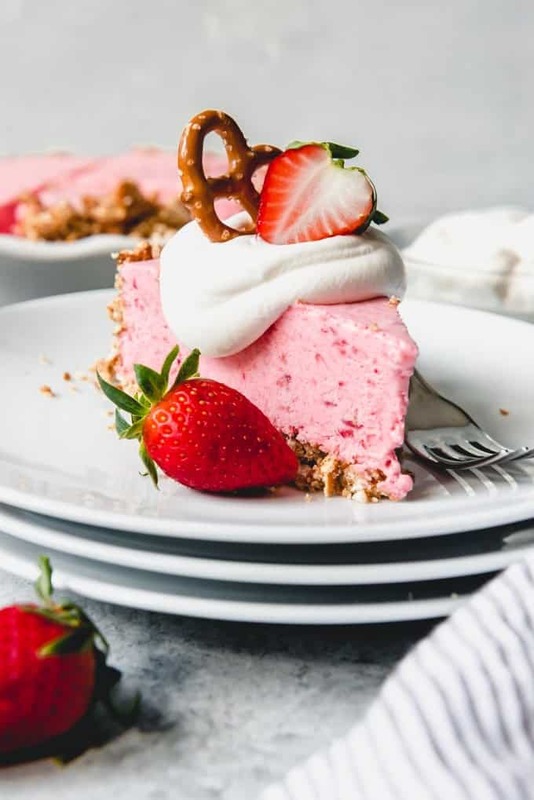 You can get the FULL RECIPE AND DETAILS on their site to make this easy strawberry pretzel icebox pie today! 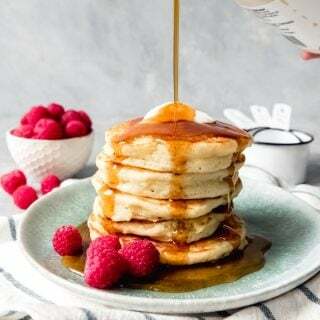 Love Pie? 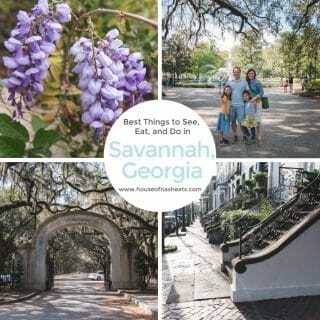 Try One of These Other Amazing Pie Recipes!